The exact sequence of nucleotides on a DNA strand is the genetic code. 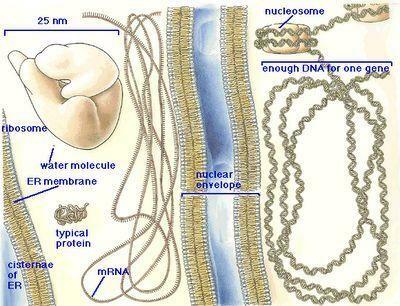 The total genetic code of all of the DNA on all the chromosomes is the genome. Each cell in the body has exactly the same chromosomes and exactly the same genome (with some exceptions we will cover later). For a gene to be expressed, i.e., translated into RNA, that portion of the DNA has to be uncoiled and freed of the protective proteins. An enzyme, called DNA polymerase, reads the DNA code (the sequence of bases on one of the two strands of the DNA molecule) and builds a single-stranded chain of the RNA molecule. Again, where there is a G in DNA, there will be C in the RNA and vice versa. Instead of thymine, RNA has uracil (U). Wherever in the DNA strand there is an A, there will be a U in the RNA, and wherever there is a T on the DNA molecule, there will be an A in the RNA. 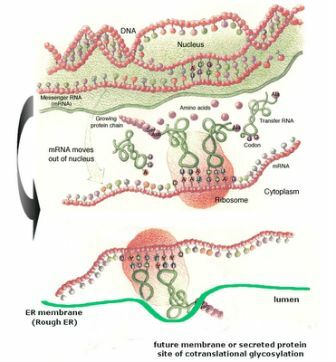 Three types of RNA are involved in the translation process: mRNA which carries the code for the gene, rRNA which aids in the formation of the ribosome, and tRNA which brings individual amino-acids to the ribosome. Translation is controlled by various enzymes that recognize specific nucleotide sequences. The genetic code (nucleotide sequence of a gene) translates into a polypeptide (amino-acid sequence of a protein) in a 3-to-1 fashion. Three nuclotides in a row code for one amino-acid. There are a total of 20 amino-acids used to build all proteins in our bodies. Some amino-acids are coded by a single triplet code, or codon. Other amino-acids may be coded by several different RNA sequences. There is also a START sequence (coding for fMet) and a STOP sequence that does not code for any amino-acid. The genetic code is (almost) universal. Except for a few microorganisms, all of life uses the same genetic code. Prions, the causes of such diseases as Mad Cow Disease, Scabies and Kreutzfeld-Jacob disease, are proteins. The primary and secondary structure of the prion is almost identical to the normally expressed proteins in our brain cells, but the tertiary structure is different – they are folded into different shapes. When a prion enters a healthy brain cell, it is capable of denaturing (unwinding) the native protein and then reshaping it in the same shape as the prion. Thus one prion molecule makes two – those two go on and make four, those four make eight, and so on, until the whole brain is just one liquifiied spongy mass. Another aspect of the tertiary structure of the protein is addition of small molecules to the chain. For instance, phosphate groups may be attached to the protein (giving it additional energy). Also, short chains of sugars are usually bound to the tail-end of the protein. These sugar chains serve as “ZIP-code tags” for the protein, informing carrier molecules exactly where in the cell this protein needs to be carried to (usually within vesicles that bud off the RER or the Golgi apparatus). The elements of the cytoskeleton are used as conduits (“elevators and escalators”) to shuttle proteins to where in the cell they are needed. Bora, I’m definitely a fan of using any animations possible to help convey the concept to first-timers. I remembered a great PBS series all about DNA. The series must have been reasonably long ago, since the video offered at the site is teeny-tiny realvideo. But someone got a great clip of the animation that covers the transcription-translation steps. No mention of modifications in the clip, though. Oh yes, that is a beauty. I usually ask them to find clips like this for homework and post links on the classroom blogs – they tend to find dozens of cool animations. The exact sequence of nucleotides on a DNA strand is the genetic code. This is incorrect. The genetic code is the correspondence between codons in the DNA and amino acids. For example, AAA -> a specific amino acid (I forget which one). Usually, the code is depicted in a table where you read down, across, etc. to find the amino acid. Actually, Hainish is correct. I’m so used to understanding the meaning of the words that I probably use the term loosely as well. Without referring to genes or promoters or other intergenic DNA bits, a string a bps is called a…? I guess just a DNA “sequence”, come to think of it. There’s DNA base pairs–> genes (+ etc)–> chromosome–> genome. On a second note, were you planning to get into DNA replication later (guessing at a cell division portion)?